Pathfinder: Kingmaker is getting a series of DLC expansions, with the first set for release December 6. The Wildcards adds a new playable race, the demon-tinged tieflings, plus a new class, and a new companion. The Wildcards DLC is included with the Pathfinder: Kingmaker season pass, but will also be available to buy separately when it launches in December. Developer Owlcat Games says tieflings proved very popular with backers and players in a poll the studio conducted on post-release content. Tieflings are said to have a drop of demon’s blood in their veins, and are treated as outcasts in the world of Pathfinder. The Wildcards also adds the kineticists, who can channel the raw elemental power of the world and are dangerous fighters both in melee and ranged combat. The Wildcards will cost $7.99. Pathfinder: Kingmaker players can expect the second piece of DLC, Varnhold’s Lot, to arrive in February. It will add a bonus campaign that introduces players to Captain Maegar Varn, who is setting out to establish the nation of Varnhold in Dunsward. This expansion will be priced at $11.99. 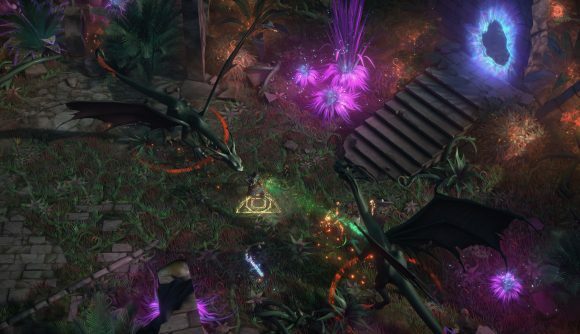 Finally, April will bring a new game mode to Pathfinder: Kingmaker. Beneath the Stolen Lands adds a new roguelike endless dungeon, which you’ll be able to explore on its own or as part of your existing campaign. Owlcat says this mode will cost $9.99 when it launches. All three DLCs are, naturally, included with the Pathfinder: Kingmaker season pass.